My brother took me out fishing with him on Wednesday. 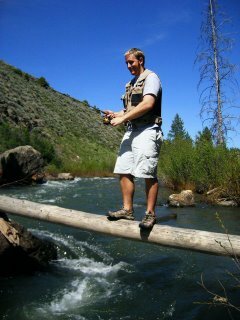 The picture is of my brother fishing on a really sketchy log... It was a really cool little hike that we had to make to get to our spot. The sad thing was that we didn't really catch any fish. Neither of us really likes to eat fish, so we would just catch-and-release anyway. This is the first time that I was fishing since I was probably like 7 years old. Wow.